You can’t buy happiness…but you can buy an RV, and that’s pretty close. 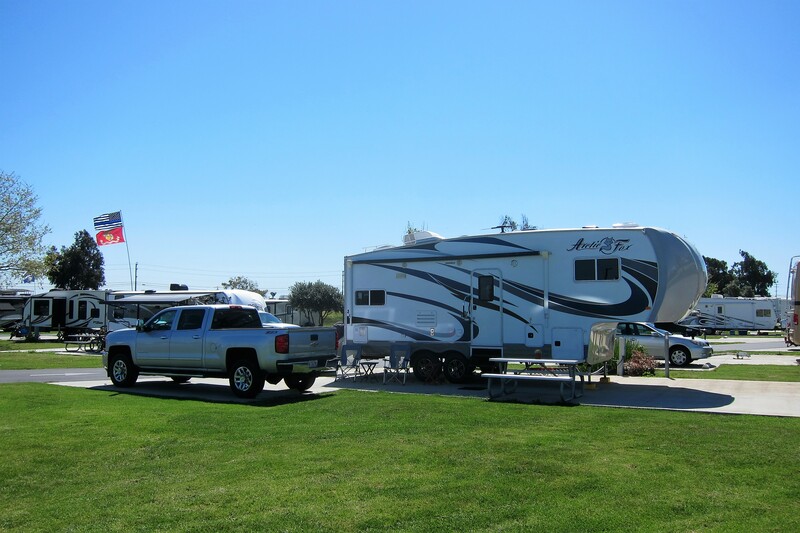 Sunday, March 19 through Saturday, March 25, 2017-Seal Beach, California: This is our second stay in the Seal Beach area, and it is quickly becoming one of our top ten favorite RV locations. It is close to the megalopolis of Los Angeles, but small enough to still have that California beach vibe of the 1960’s…and it is close to other classic California beach communities. 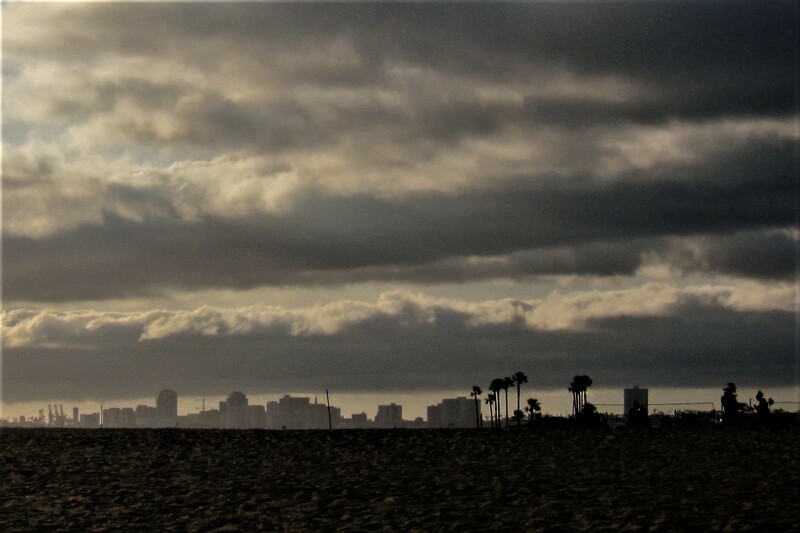 The town is nestled between the industrial port city of Long Beach to the north and the more touristy, self-proclaimed “Surf City” of Huntington Beach to the south. A relatively small town of 24,000 folks Seal Beach’s main employer is the Boeing Company whose prime customer is NASA. 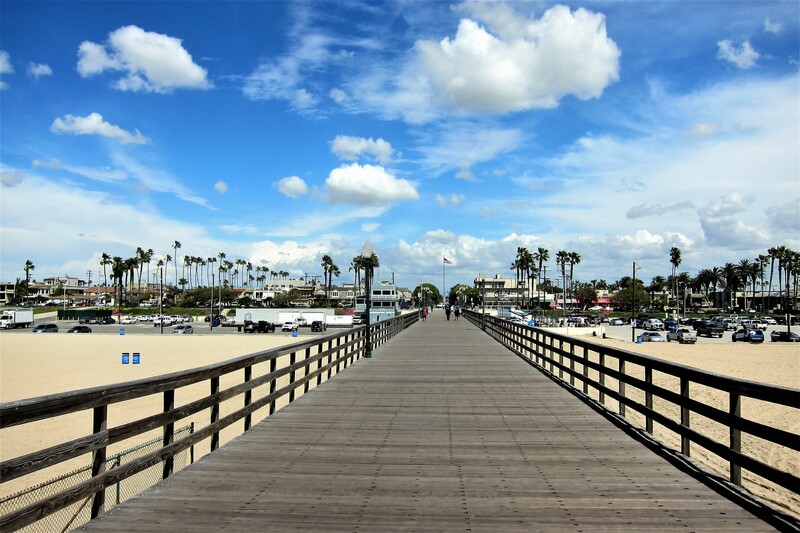 Originally known as Anaheim Landing, a seaside resort area of the California city of Anaheim, the Town of Seal Beach is a quaint, quiet, and as of yet undiscovered by the throngs, beach town. Seal Beach is also home to the US Navy Weapons Station, a port call we made frequently on the way to the Western pacific and the waters off Vietnam. 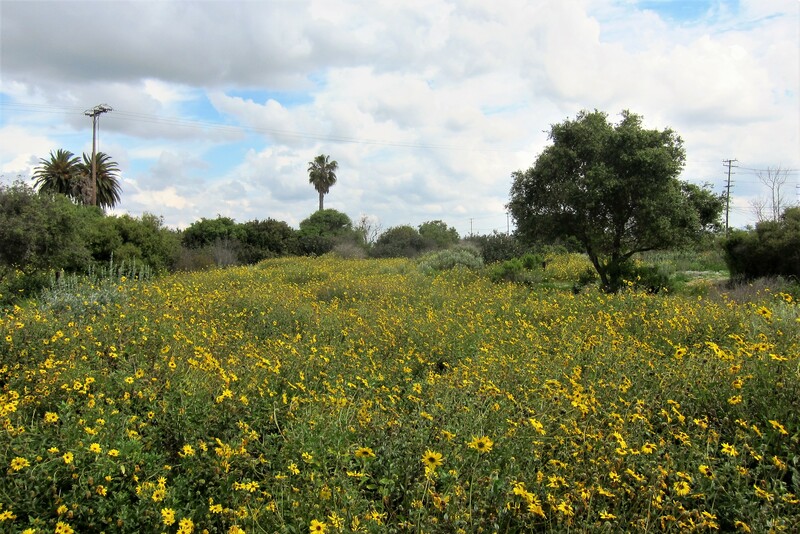 Needing a sizable area for safety and security reasons, the weapons station has put much of the its land into conservation by hosting the Seal Beach National Wildlife Refuge. An interesting side note is that this 965-acre Salt Water Marsh, is managed by the National Fish and Game Department and overseen by a young Game Warden from Bath, Maine! 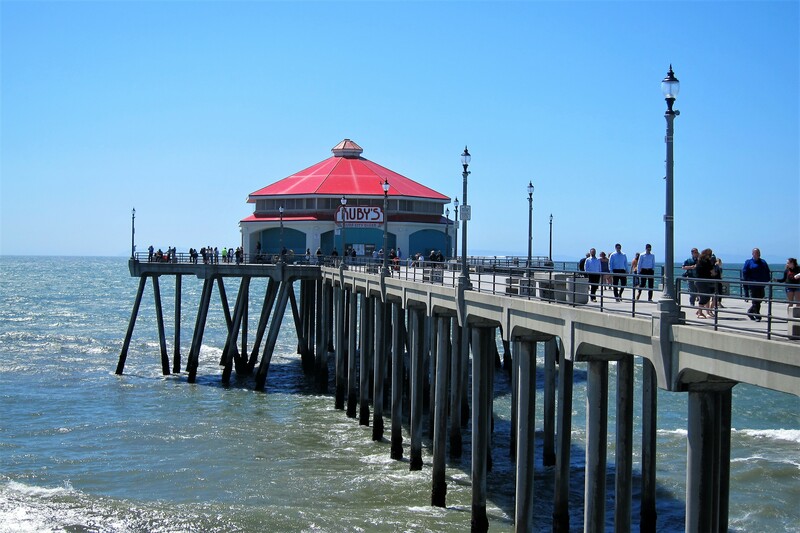 Many coastal California towns feature a pier jutting out into the ocean and Seal Beach is no exception. Suitable for fishing and pedestrian strolling it provides a view of the town normally enjoyed only by boaters or surfers. Kit and I enjoyed walking about this small beach community and poking into the shops, galleries and restaurant that line Main Street. One of the RV’rs favorite pastimes is to wander about the campground and check out license plates to see where everyone hails from. Being this far from the Northeast, it is rare to spot any plates from New England and especially from the state of Maine…I’m guessing due to Maine retired folks’ predisposition to head directly to Florida for the winter. However, during our stay we met these fine folks camping directly across the road from us! Darrell and Becky live near Maine’s Pleasant Pond, just a few miles from our home. Darrell, retired from the Navy and Becky who retired from the Supervisor of Shipbuilding have also been snow-birding throughout the country. 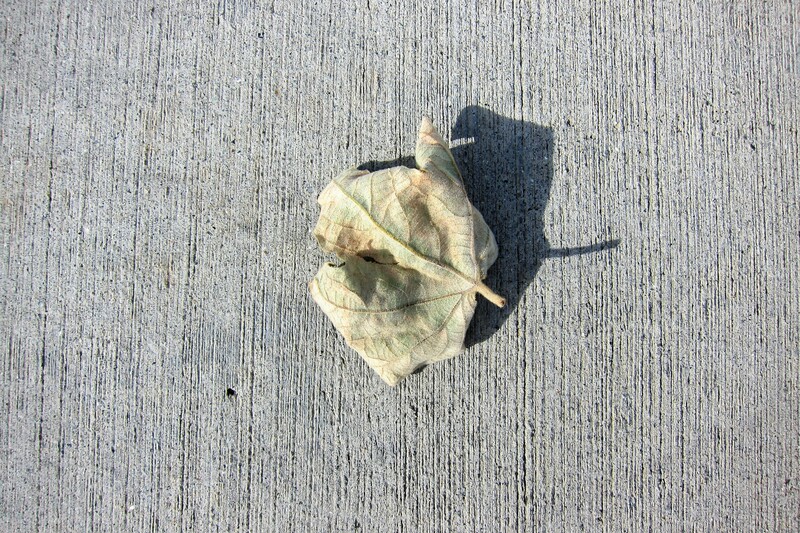 We hit it off immediately, and spent a few pleasant evenings sharing cocktails and stories. They seemed to be interested in my passion for high performance kite flying, so one day we met on the beach and I broke out the kites. After some very brief instructions, they took turns flying and soon had the 1.5 meter parafoil dancing in the sky! 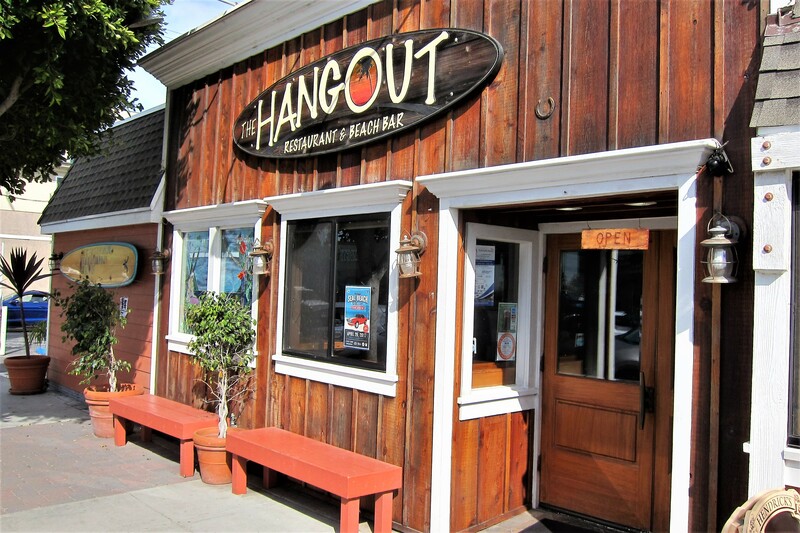 Following a few enjoyable hours on the beach, we retired to a nice beachside restaurant called The Hangout. Where we continued to enjoy their company over a few beers and some excellent food. Exchanging contact information, we vowed to stay in touch and connect when we all returned to Maine. As the sun set in the western sky, Kit and I walked back to our truck where I snapped the following photo looking across the bay toward Long Beach. Not your typical California sunset photo, but I thought it striking enough to close out the day with. 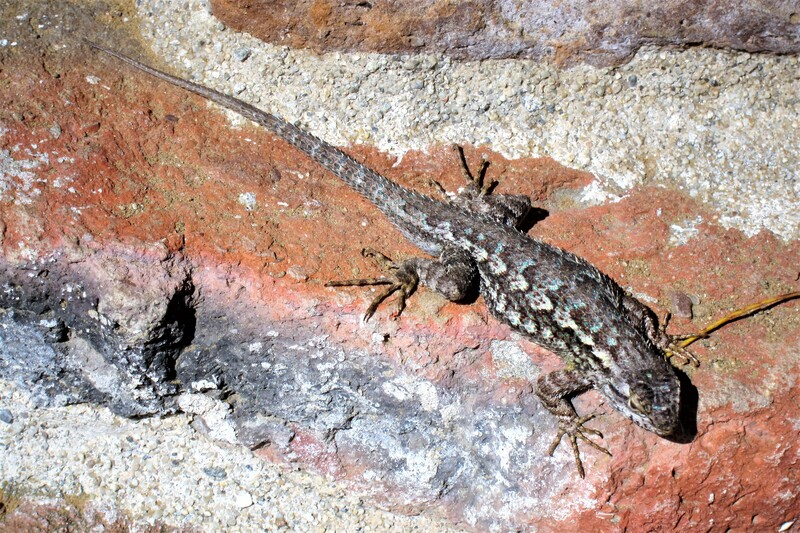 And, by the way, that photo is in full color…believe it or not! 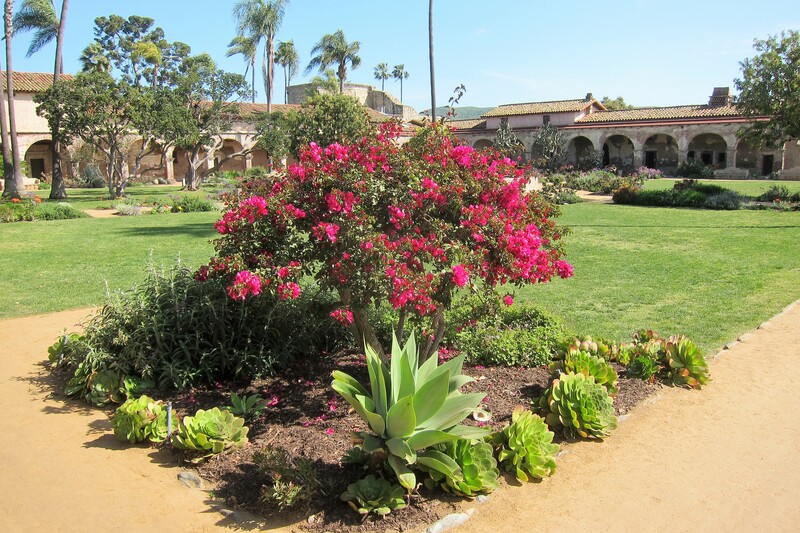 One item on Kit’s Bucket List was to visit San Juan Capistrano. This quaint and historic town of 34,500 folks sits 35 miles to the south just inland from Dana Point. Settled in 1776 around the Spanish Mission of the same name, many adobe buildings have stood in town since the early 1800’s. 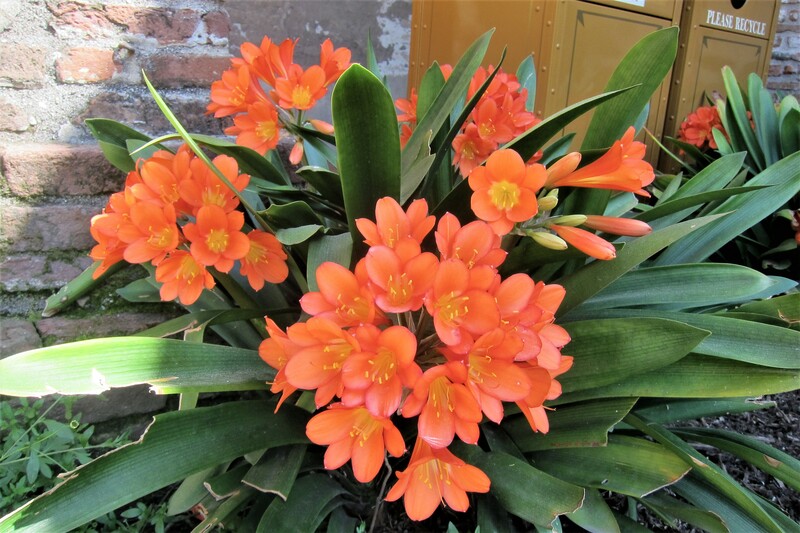 Visiting the area in 1830 while serving aboard the sailing brig Pilgrim, Richard Dana, author of the classic Two Years Before the Mast, exclaimed; “San Juan is the only romantic spot in California” …a statement that may still be true to this day. 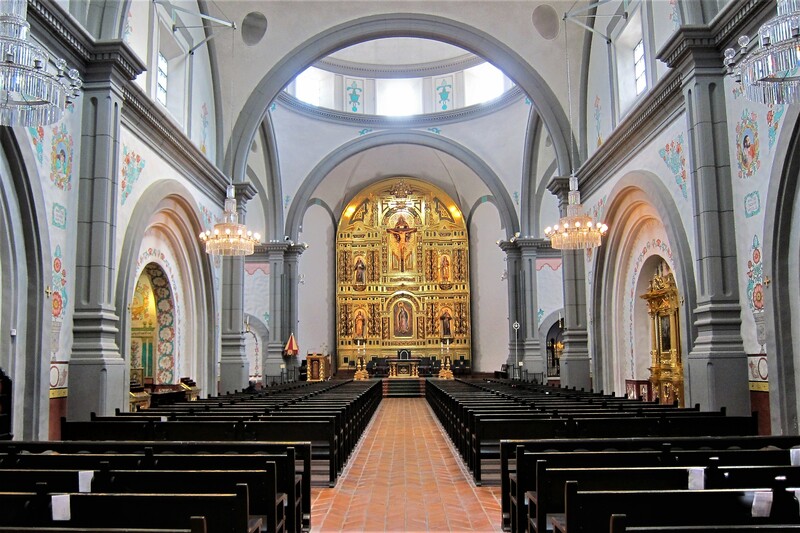 The chapel on the grounds of Mission San Juan Capistrano is the oldest structure in continuous use in the state of California. 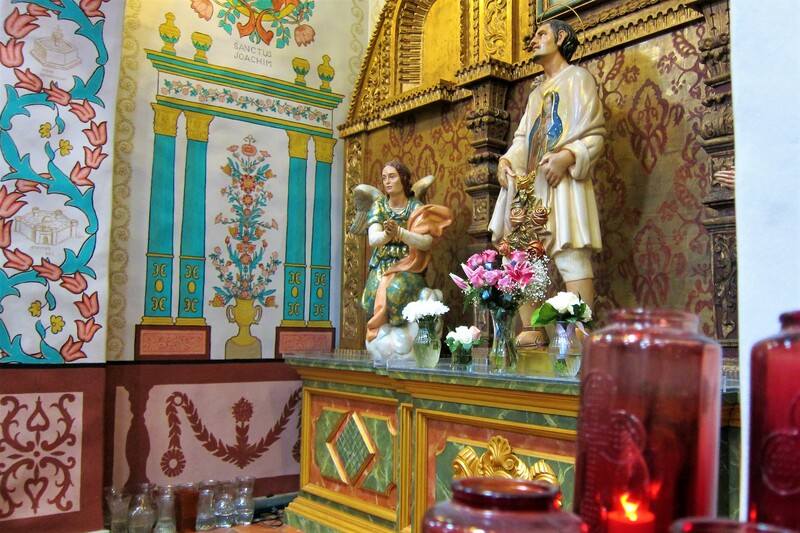 Daily Catholic Mass has been said in the mission chapel for the past 241 years! Once again, as in other mission buildings, the narrow profile of the chapel is a direct result of the height of the available trees in the area that were downed to form the roof rafters. 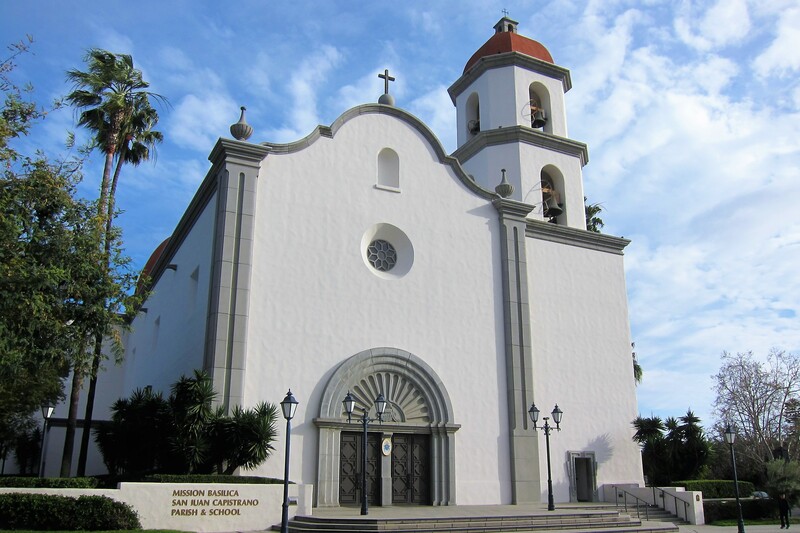 This is the only mission church where Father Junipero Serra, the Apostle of California, was known to have held services. As in the past, Kit and I lit a votive candle for the many departed family and friends we have lost. Also on the premises is a much larger house of worship, that was constructed in 1986. The interior of The Basilica is very impressive indeed. 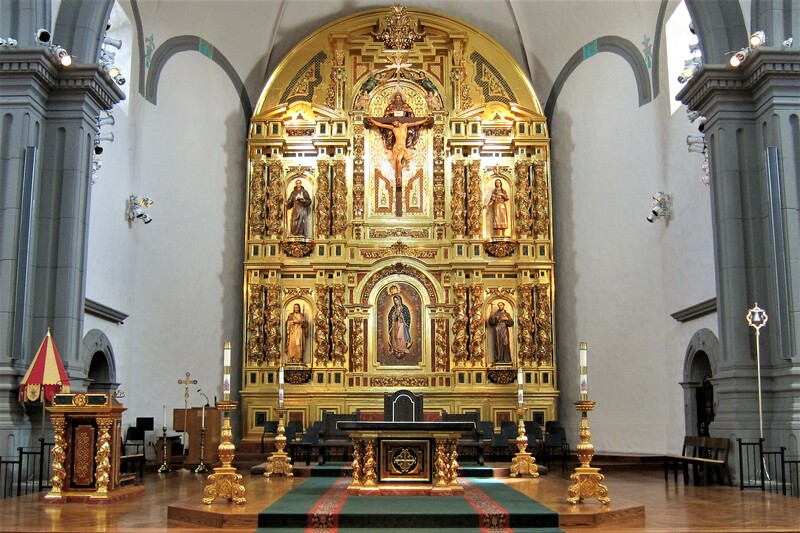 The Grand Retablo with The Trinity at top center is carved from cedar, and covered completely in gold leaf. Also, many hand painted murals decorate the Basilica walls. 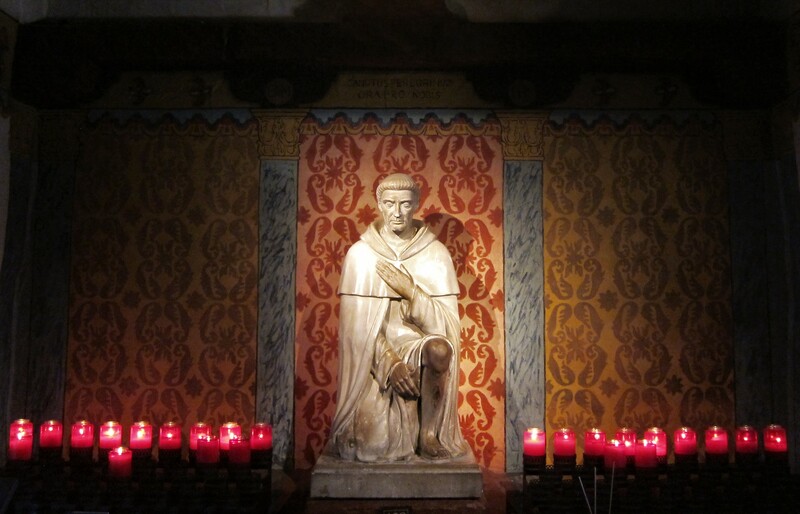 As a nod to modernization, the votive candles located throughout The Basilica are electrified. One just makes a donation and flips a switch to send your prayers and wishes to the heavens…not sure how I feel about that but we “energized” a candle anyway. 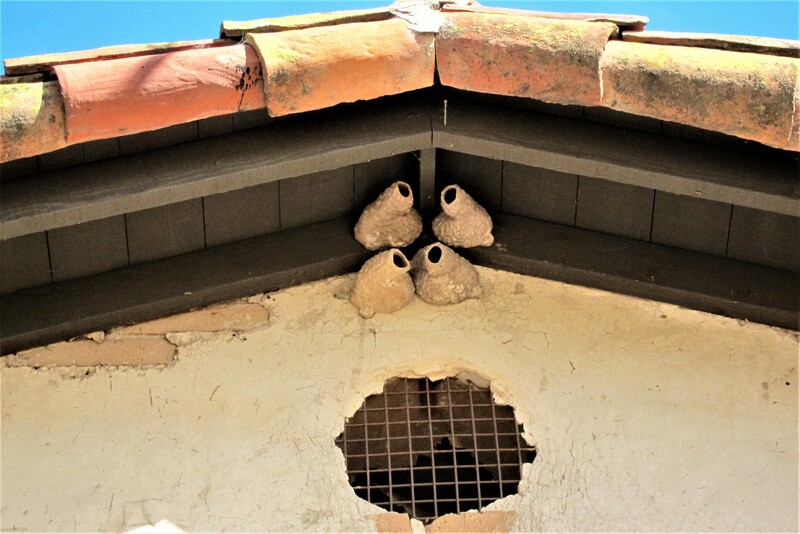 San Juan Capistrano is also famous for the seasonal return of the American Cliff Swallows who build their mud nests under the eaves of various Mission structures. 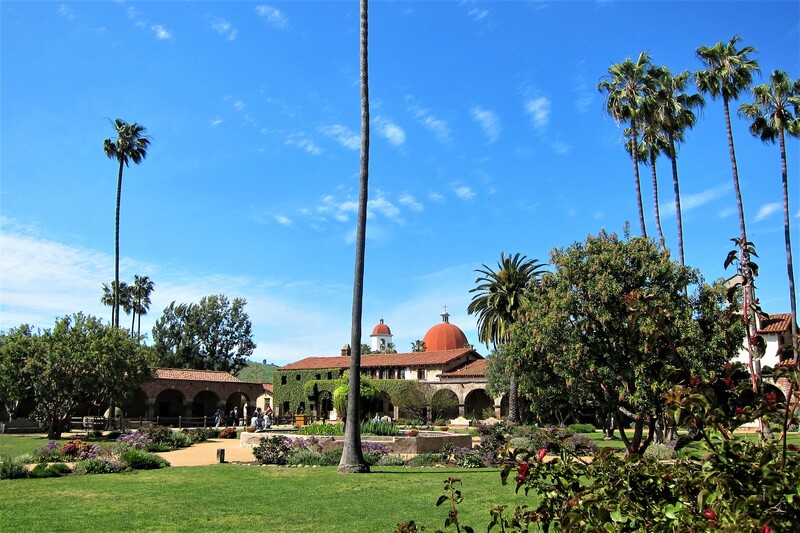 The swallows make their annual migration from their winter roost in Argentina flying over 6,000 miles to their summer home in the Mission San Juan Capistrano. Which makes them, I would surmise, the original snowbirds! Also on the mission grounds lies a beautiful courtyard. Which was incredibly landscaped with native vegetation, trees and bushes. Such as this colorful flowering bush. There is also a central fountain and lily pond. A perfect environment to rest and reflect. For man, woman, or beast. 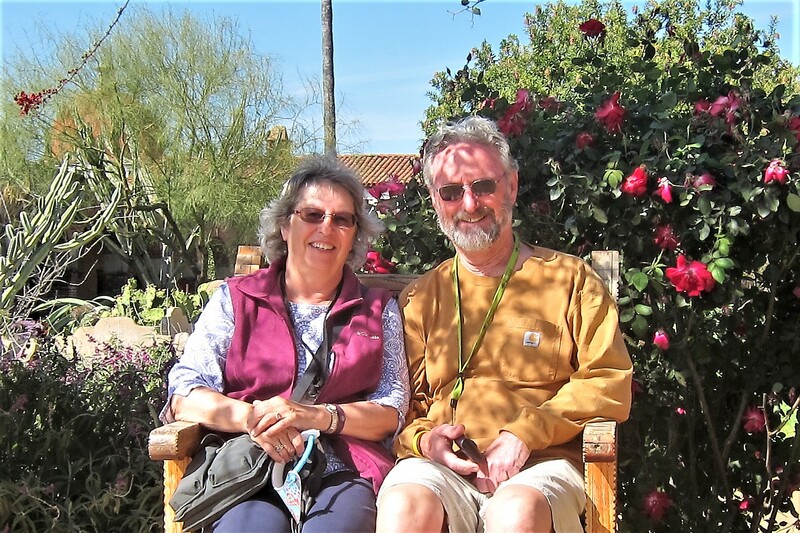 At the end of the day exploring the San Juan Capistrano Mission District Kit and I were getting hungry, so on advice of one of the Mission docents we walked into town for a fine Mexican meal at El Maguey’s. The restaurant is under third generation management and the food was incredible! 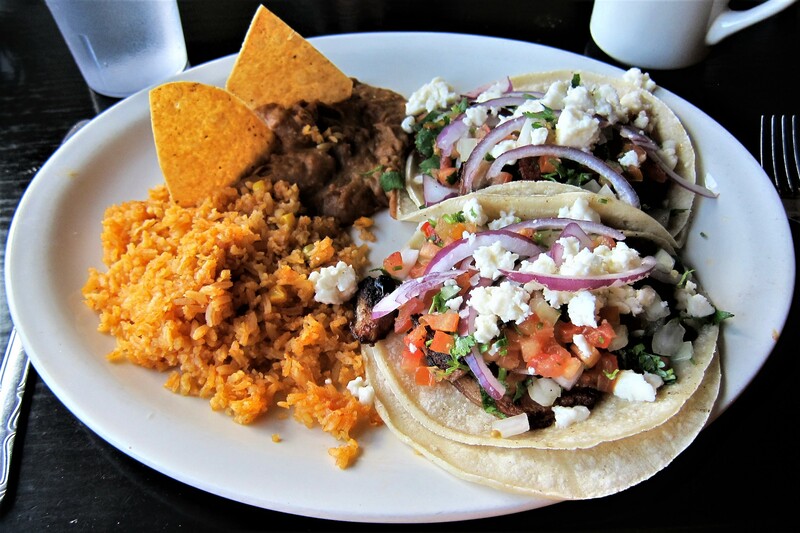 I had the Carne Asada plate with house made rice and refried beans. 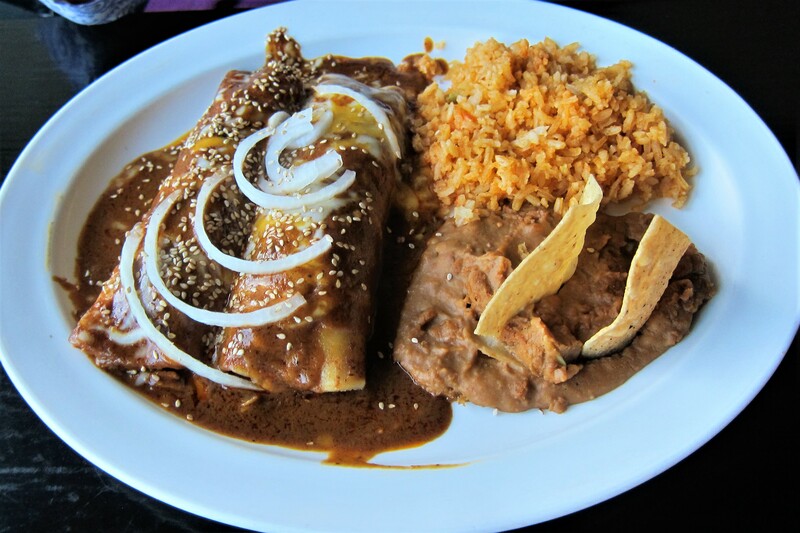 Kit enjoyed a burrito with Mole Poblano sauce. Which was a first for her and she really enjoyed the flavor this Mexican condiment gave the food. 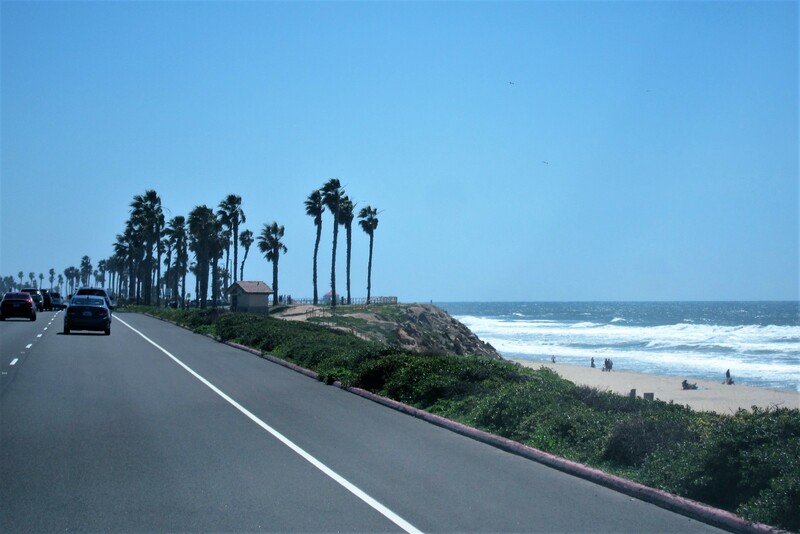 Then, on yet another day, Kit and I took a ride south on the Pacific Coast Highway toward Surf City USA. 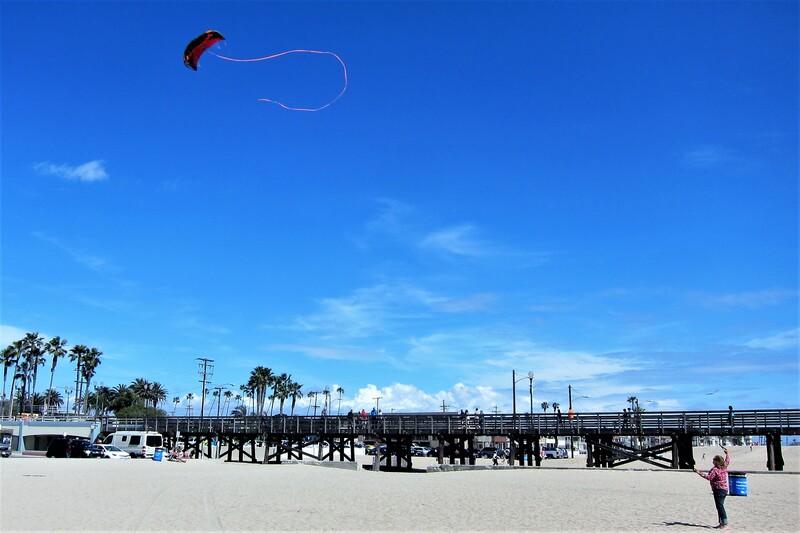 Huntington Beach, a city of 190,000 folks, came by the moniker of “Surf City” when the California surf-music duo Jan and Dean divulged that their classic 1963 song “Surf City USA” was inspired by Huntington Beach. 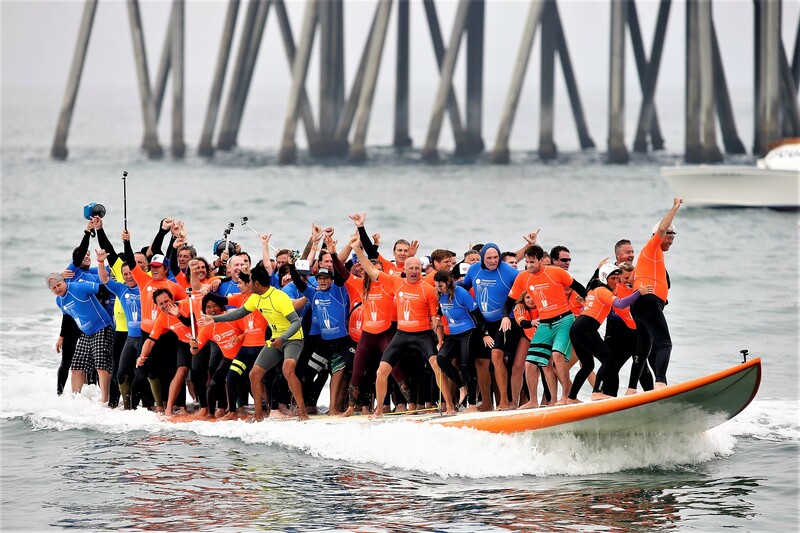 So, it is appropriate that the World Surfing Championship is held in the waters off Huntington Beach each summer. And yes, this beach community features a pier jutting into the ocean as well. From which a panoramic view of the beach can be enjoyed. And a bird’s eye view of the locals catching winter shore breaks nearby. At the foot of the 1000-foot pier lies Ruby’s, a local dining institution. 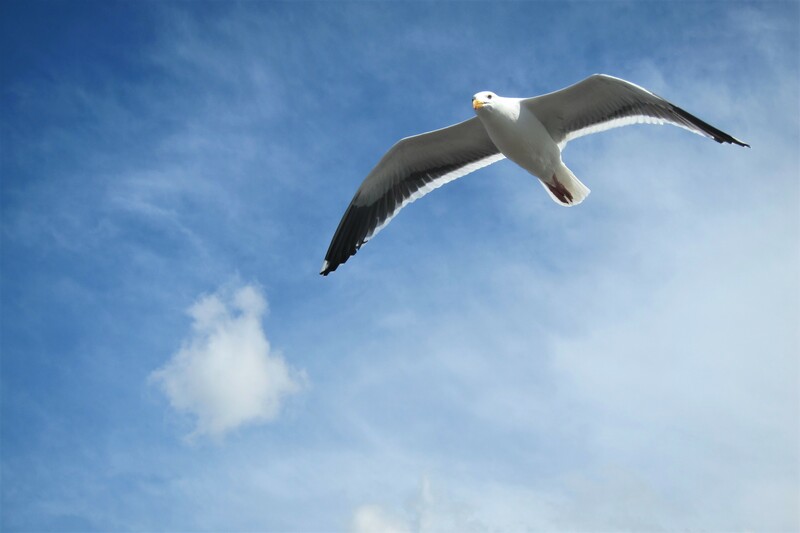 And many of California’s Gull population hover in the onshore breeze above fisherman, and the occasional unsuspecting tourist. 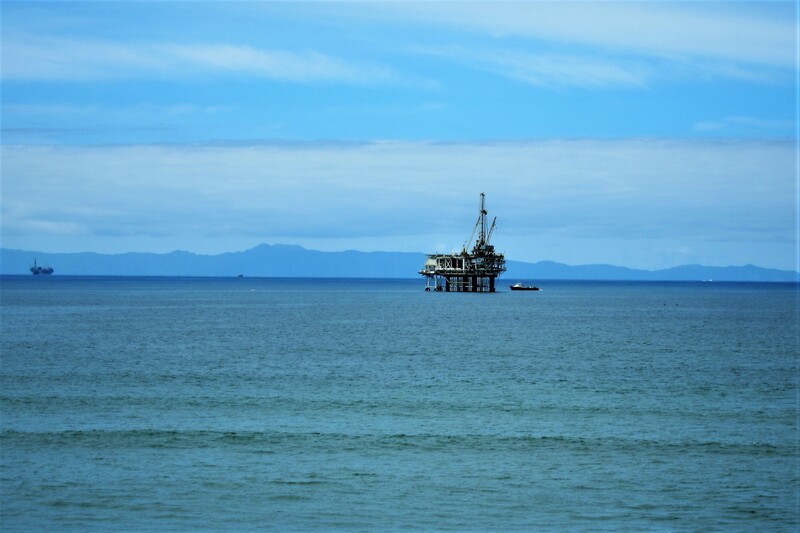 As picturesque as these scenes are, just a few miles offshore there is some serious submerged drilling and pumping going on. 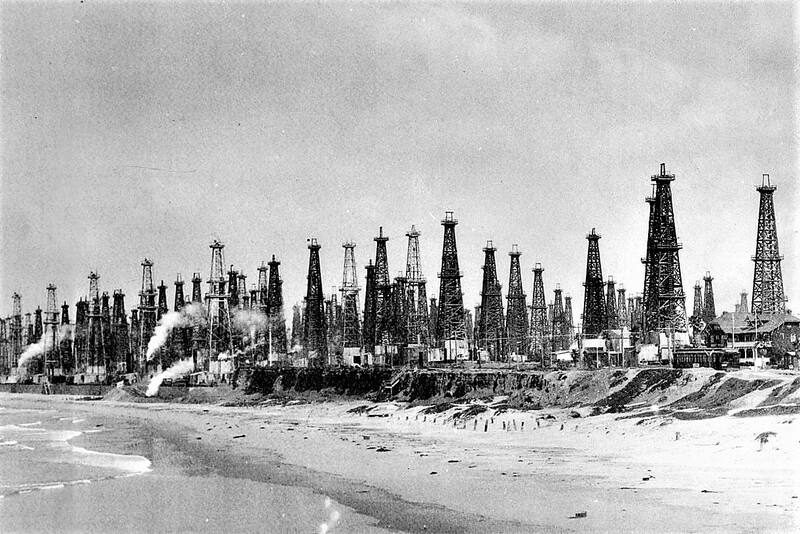 Oil drilling has been going on in this part of California since the 1920’s. 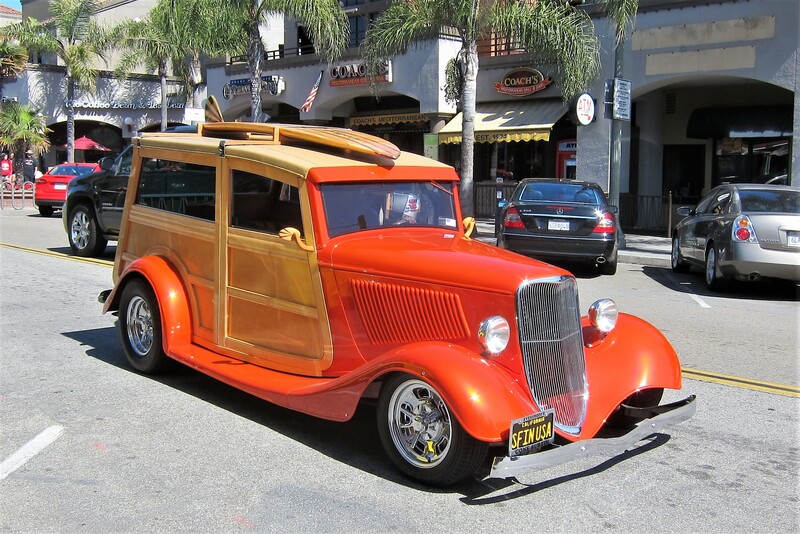 Many years ago, on the rare occasion when we could gather enough gas money and pile our boards on someone’s barely running car, we would head north from San Diego to sample the surf in Huntington Beach. But unlike those days, the oil drilling process is far cleaner now…no longer is there “Tar Balls” washing ashore, nor is there the smell of oil in the air. One of the legends in the early years of California surf history is a local gentleman by the name of Bob Bolen. Professionally known as “The Greek”, Bob started shaping surfboards as a teenager in his garage…as most of us did. 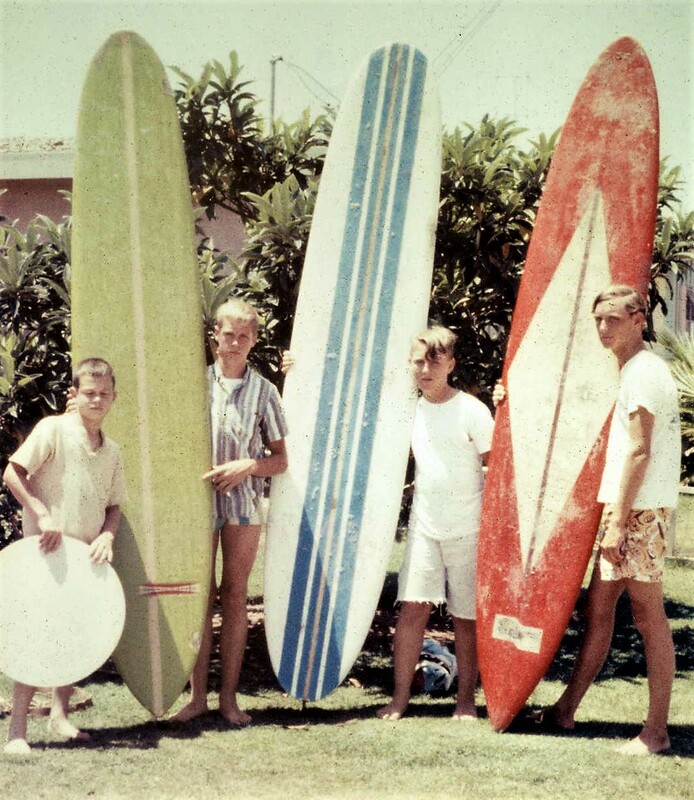 Yep, that skinny dork on the right is a 13-year-old Bill posing with the crude surfboard I built in my garage. Next to me is my brother Don, a lot smarter and wealthier…he had a “store-bought” board as my buddy Billy did, a nice Gordon and Smith model. The “kid” on the left is Billy’s brother, Tommy, sporting a skim-board of the day. Unlike most teen surfers of the early 1960’s, The Greek persevered and became a nationally ranked competitive surfer as well as one of the top shapers in the Huntington Beach area…and at 74 years old, he’s still at it! 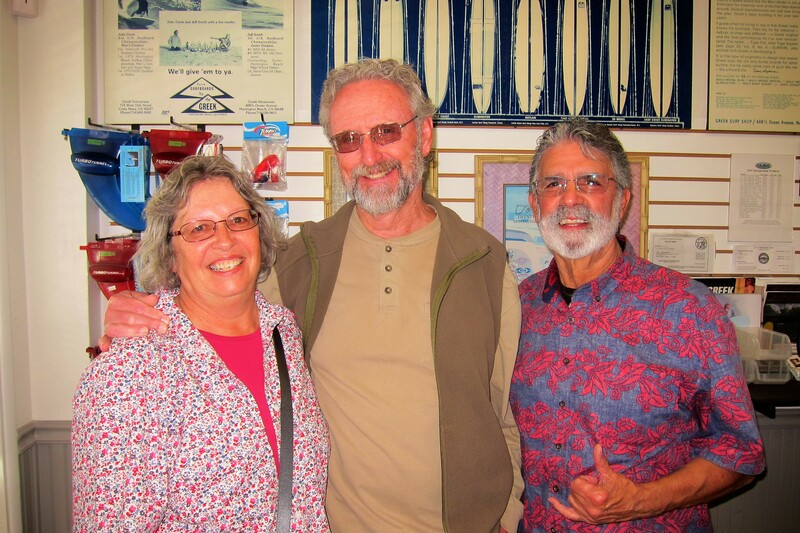 It was thoroughly enjoyable to visit Bob and “talk story” about the early days of surfing in California. In addition to his surf shop, Bob is a real estate broker in town. If you’re ever in Huntington Beach, stop by his office and learn more about his fascinating life. 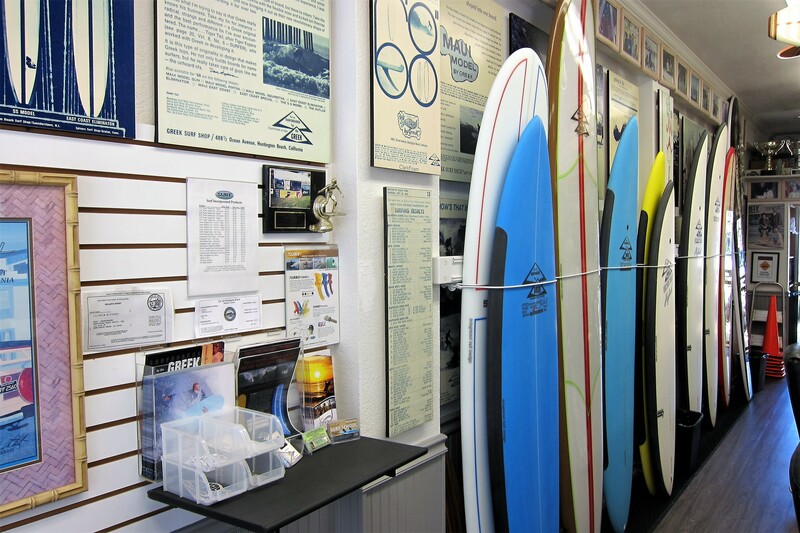 Another must stop in “Surf City” is The International Surfing Museum. 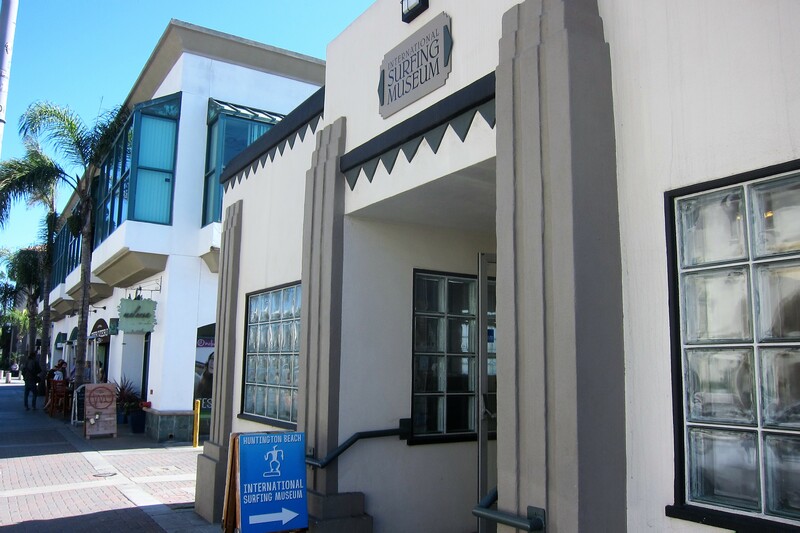 Not as large or well displayed as Oceanside’s California Surfing Museum, it does have some interesting artifacts from the golden age of surfing. The bottom board in the photo above is representative of the size and design we used to catch waves on at the breaks in and around San Diego. 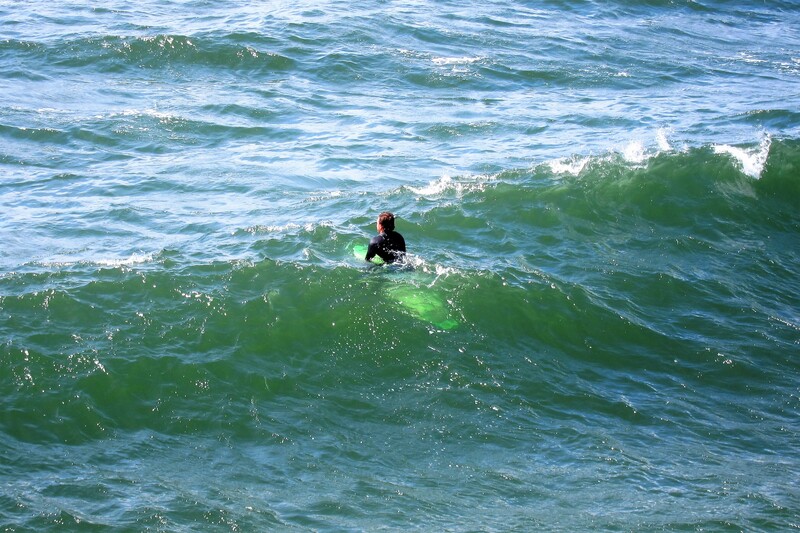 Today the rage is the “short board” about half that size and providing little flotation. 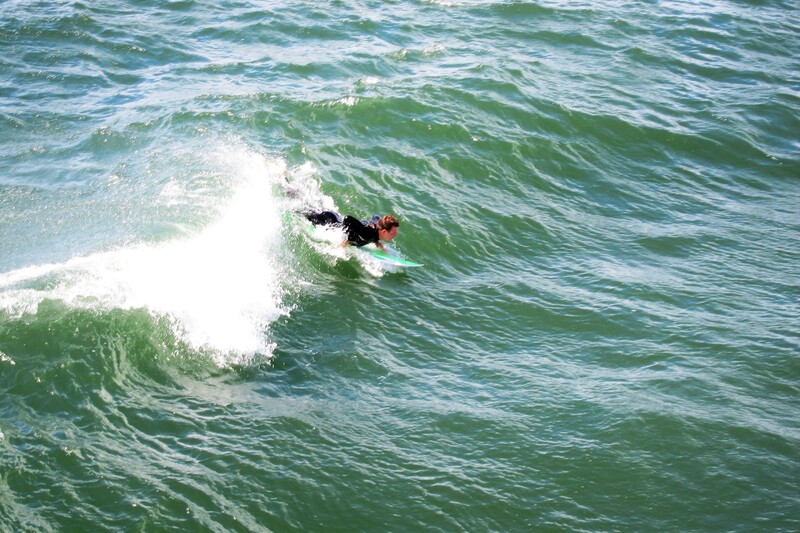 A short board partially sinks until the surfer paddles hard and catches a wave. 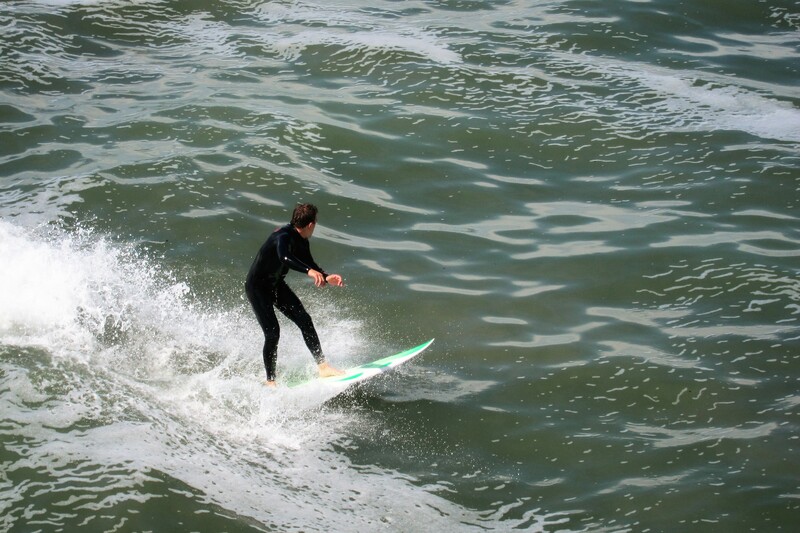 At that point, a short board becomes superior to the long board, able to snap turns quickly and accelerate without walking the nose…guess if I was younger and just learning to surf I would select a short board as well. 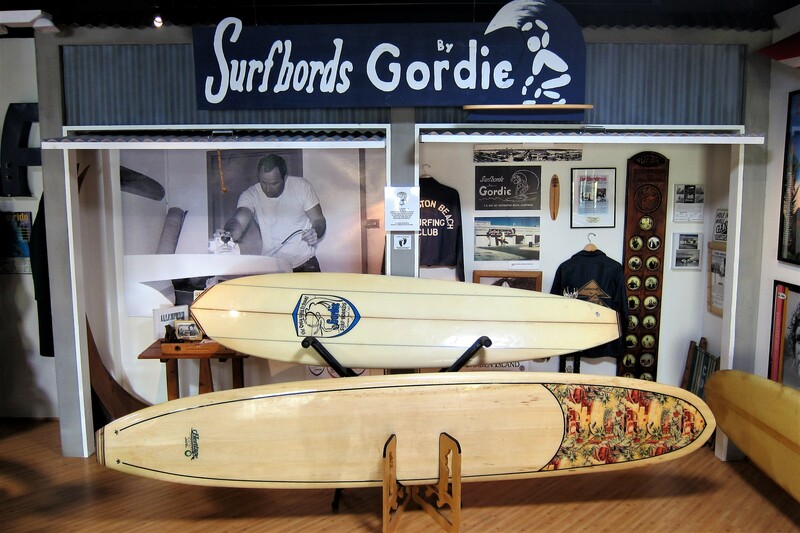 The museum also has a very unique and interesting surfboard…one of a kind! 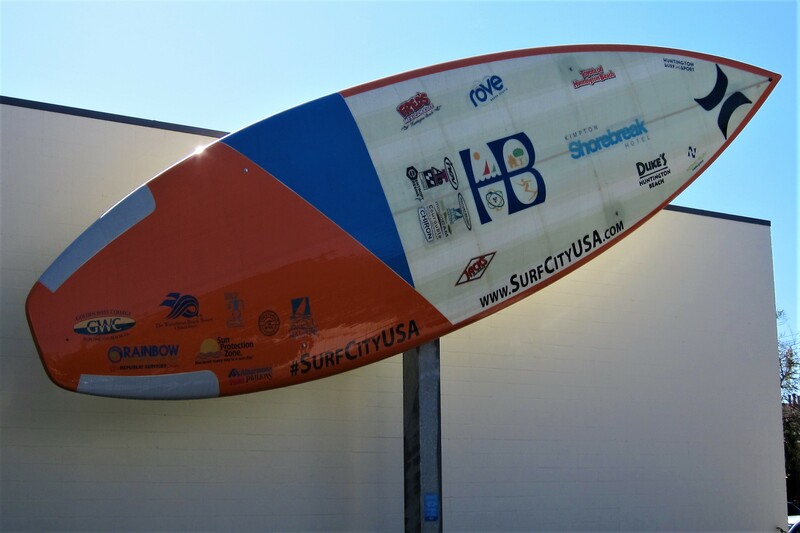 The board, so large it had to be exhibited outside, was used to break the Guinness Record for the most surfers riding a wave on one surfboard! Other than the record 66 folks on one board riding a wave, the other unique thing about this 42-foot-long, 11-foot-wide monster, is that it was shaped by a little know surfboard manufacturer in…Rhode Island!?!? 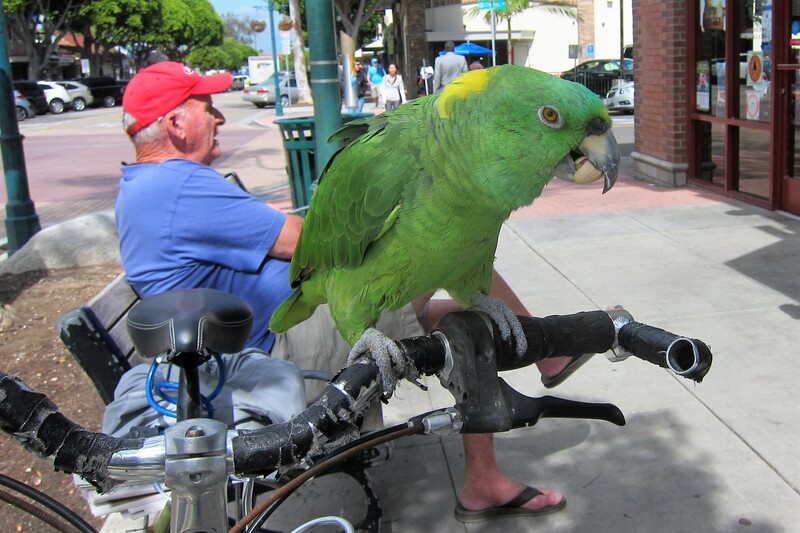 Huntington Beach is a fun place to walk about, take in the sights and meet the locals…such as this retiree and his parrot who ride their bike into town and visit other retirees on the beach. The Pistachio you see in the bird’s beak was plucked from my fingers just seconds before. It is also fun to just to sit and watch some of the nice cars cruise down Beach Boulevard. A great day in a classic beach community! Back at the camp, we also spent time enjoying our spacious site by sitting outside to read, or just relax. Oh, one funny thing happened as I was preparing the truck and camper for departure. Kit came out and asked me to pick up the wadded-up paper towel she claimed I had dropped. Yep, time for your annual eye exam there, Kit! So, as the sun sets on our final day along the coast of California, I feel compelled to add one last Pacific Ocean sunset scene. Tomorrow we begin heading east…stay tuned! 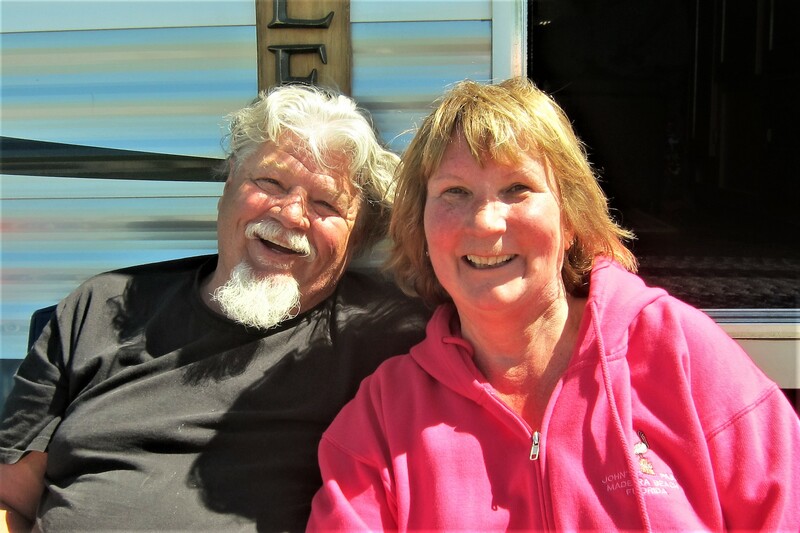 Kit’s Bit’s: I particularly enjoyed Seal Beach, both the RV Park and the town itself. It’s much smaller than either Huntington Beach or Pacific Beach where we hung out during our teen years, thus, easier to walk about, browse the shops and get a bite to eat. It was great meeting Darrell and Becky from Maine and getting to know them. Hope to see them again this summer. 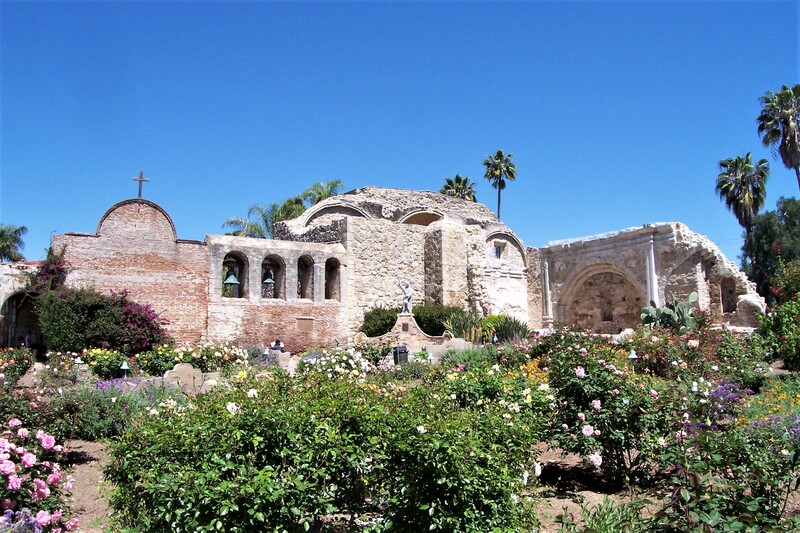 I thoroughly enjoyed finally seeing San Juan Capistrano in its entirety! During our very brief “honeymoon” which was one night in a motel in Orange, CA, I wanted to stop by and visit the mission on our way home. Bill had planned to go surfing late that afternoon with his buddies Rodney & Billy and, well, I hadn’t quite learned to speak up yet so, he got his way. I learned quickly after that, though! I toured it briefly with my sister many years later but we didn’t have the time to see the entire mission. So, finally, I can check it off my Bucket List, after nearly 52 years. Bill, Another weapons station is Concord Weapons Station, which is where my brother retired from. He was a fireman there and oversaw many munitions loaded and stored. Didn’t know there was a weapons station in Concord?!?! Thanks for sharing a portion of your families military history…hope you both are doing well! Loved all the photos and history of the area! I bet this would be a favorite for Jimmy Buffet. Thank you very much, sorry about the delayed reply…time seems to get away from us while on the road! 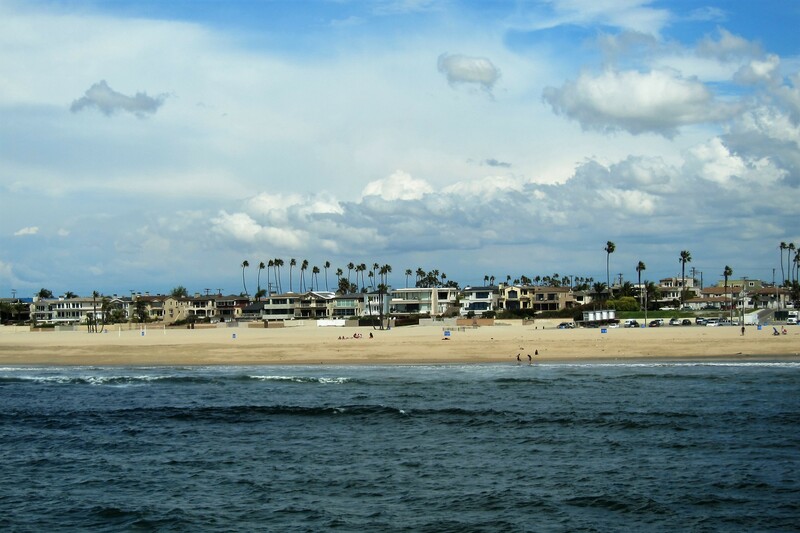 Seal Beach is so gorgeous! 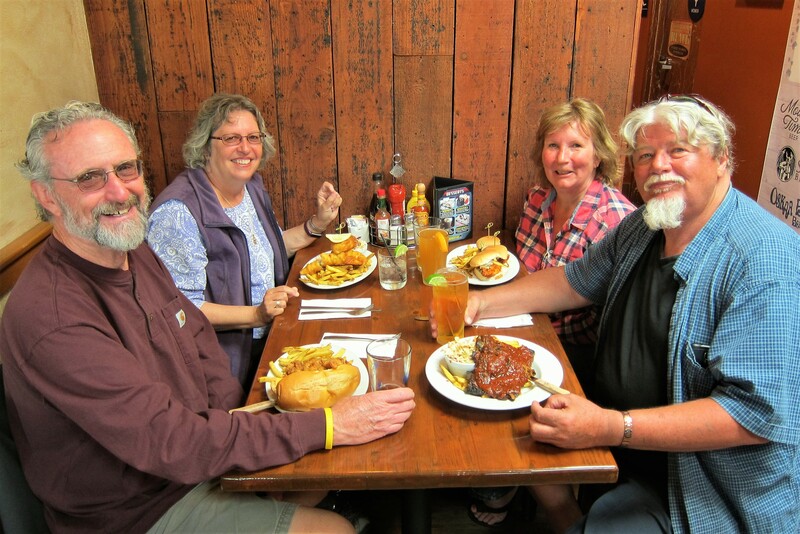 Glad you found some playmates in Darrell and Becky …and to be Mainers to boot! 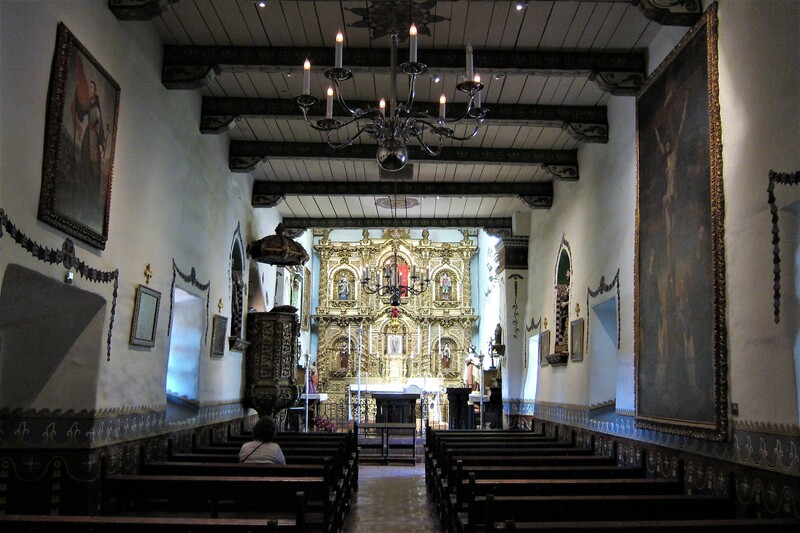 The pic of the chapel at Mission SJ Capistrano is striking! 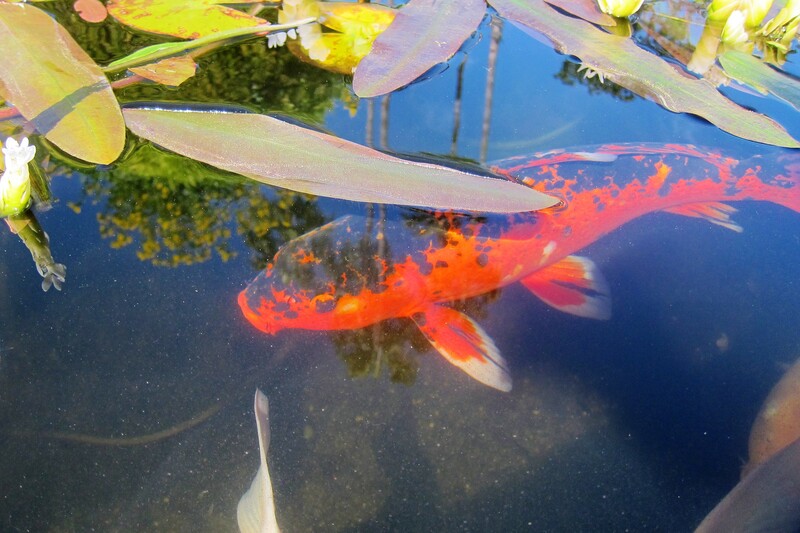 Beautiful grounds…..what a great place to stop and reflect! …Very glad to hear the current oil drilling process has improved considerably from years ago! Gives us all hope. 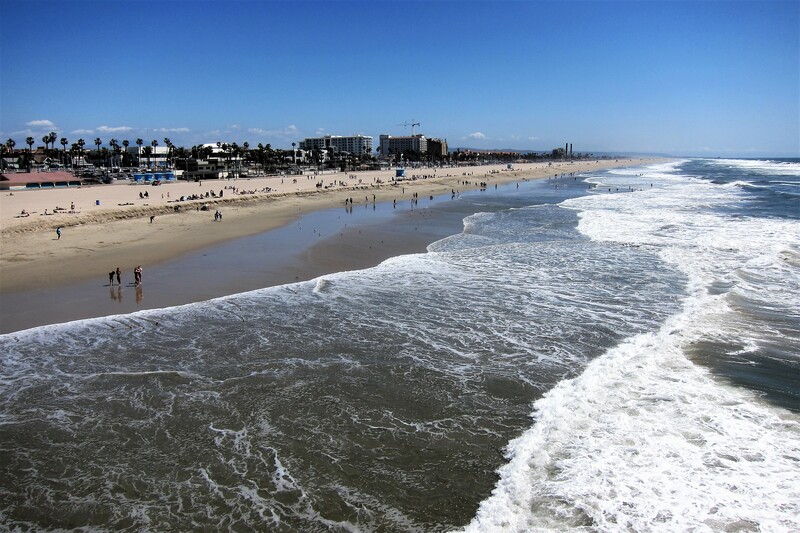 Huntington Beach looks like a very happy place and a terrific vacation spot! 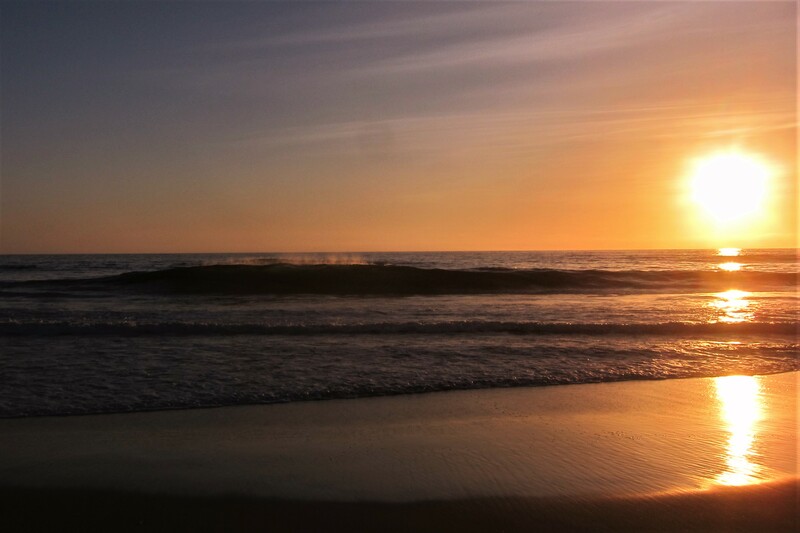 ….Thank you for another one of your beautiful sunset pics over the Pacific Ocean! Love those! Thanks Nancy, for your always insightful and kind comments. Kit and I like to seek out the lesser known tourist and historical spots and enjoy learning about them…glad you enjoy that as well! Take care, hope to see you this summer! BEAUTIFUL AREA CAPISTRANO, AS A KID WHEN WE HAD THE FARMS, WE ALWAYS LOOKED FORWARD TO THEIR RETURN. THEY DID BUILD SOME NEST IN THE BARN THAT SORTA MESSED UP A LITTLE HAY! GREAT INSECT CATCHERS AS WELL! SPRING IS SURE DRAGGING ALONG, VERY COOL, CLOUDY AND SOME PRECIP. YOU MIGHT BE WISE NOT TO HURRY! HAVE A SAFE JOURNEY ENROUTE EAST! Thanks Buddy…looking forward to seeing you folks in a few weeks! 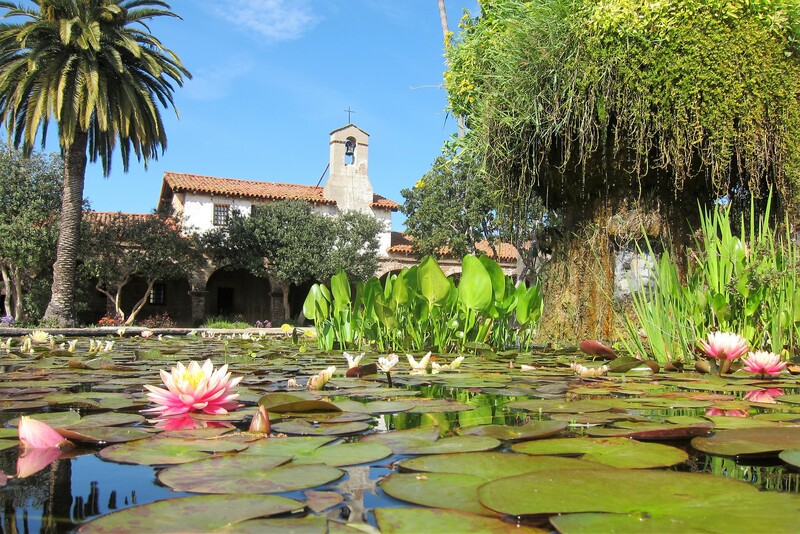 The Capistrano Mission area is beautiful! Thanks for the pictures. I would love to see it in person! As a child I new a Darrell who spent a lot of time around Pleasant Pond. Did this Darrell grow up around there or is he a transplant? Remember our friends Terri and Lee Burnes,? 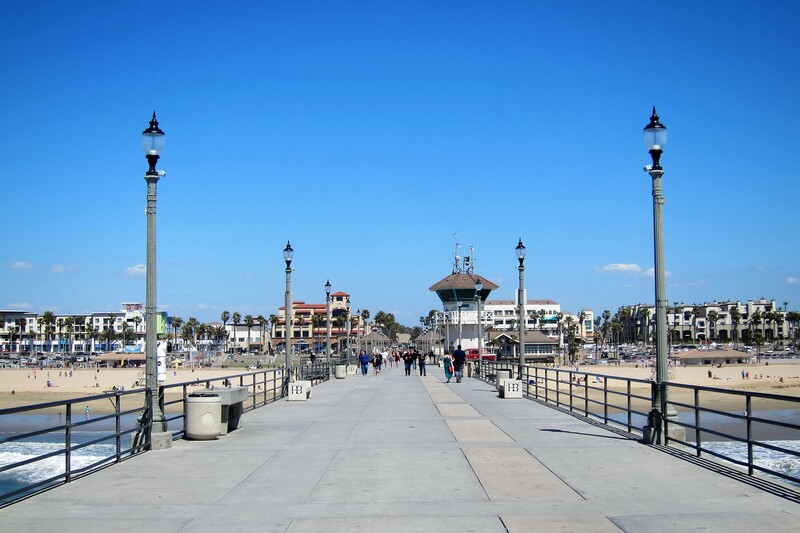 Did you know that Huntington Beach was where Lee had his medical practice during all his years of practice? See you soon. Leaving 5/4 and spending only a couple of days with Bev and Doug. Don’t know our route beyond that. You are welcome…thanks for the nice comment! Darrell hails from Texas, but has lived in Maine for a number of years. Yes, we do remember Terri and Lee…and Blue Hill! Please have a safe and enjoyable trip home, and tell Bev and Doug we said hi. looking forward to seeing you soon!